Immigration Minister Jason Kenney says he won't use his authority to intervene in a decision to bar controversial British MP George Galloway from entering Canada. 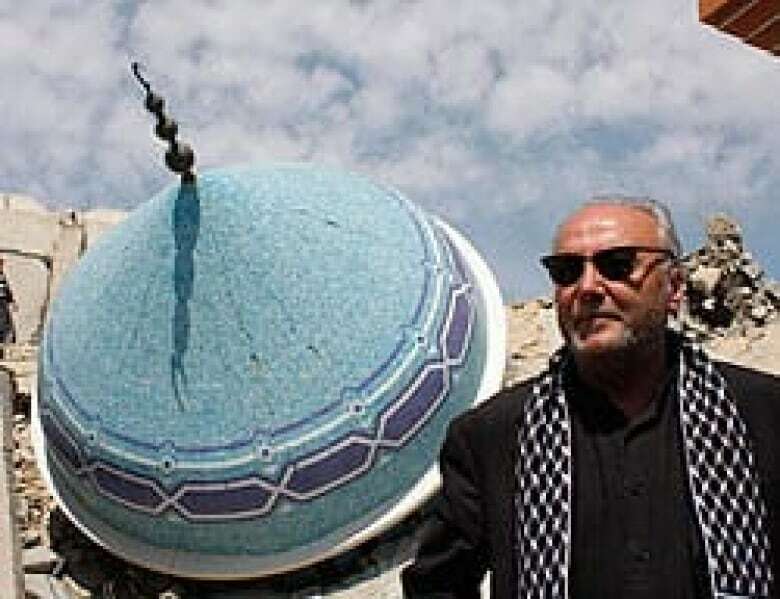 British lawmaker George Galloway inspects the rubble of an Islamic school earlier this month in Gaza. Galloway has been banned from entering Canada. ((Associated Press))Immigration Minister Jason Kenney says he won't use his authority to intervene in a decision to bar controversial British MP George Galloway from entering Canada. Speaking in Calgary Friday, Kenney said he wouldn't override a Citizenship and Immigration Canada decision to deny Galloway permission to enter the country based on security grounds. Kenney's office said the 54-year-old Scot has expressed sympathy for the Taliban in Afghanistan and provided financial aid to the Palestinian militant group Hamas. Kenney's spokesman, Alykhan Velshi, called the decision to bar Galloway a "matter of law" taken by border officials in accordance with Section 34(1) of the Immigration and Refugee Protection Act, which bans those who provide material support for terrorist groups. Galloway called the decision "irrational, inexplicable and an affront to Canada's good name," and said he would fight the ruling with "all means at my disposal." Galloway was to speak Monday, March 30, at a Toronto conference called Resisting War from Gaza to Kandahar, hosted by the Toronto Coalition to Stop the War, and at a public forum the following day in nearby Mississauga. Galloway, a former British Labour party member now with the Respect party, said the "idiotic ban shames Canada." "This … is a very sad day for the Canada we have known and loved — a bastion of the freedoms that supporters of the occupation of Afghanistan claim to be defending." "All right-thinking Canadians, whether they agree with me over the wisdom of sending troops to Afghanistan or not, will oppose this outrageous decision. On a personal note — for a Scotsman to be barred from Canada is like being told to stay away from the family home. This is not something I'm prepared to accept." Liberal Leader Michael Ignatieff, speaking to reporters after a speech in Winnipeg Friday, said while he's no fan of Galloway, people can't be banned from Canada for what they may say. "If he is being barred on free speech grounds that is an outrage," said Ignatieff. "He can come to Canada and talk rubbish all day long as far as I'm concerned." But Ignatieff said Canadian security officials may know something he doesn't. "If there is a security threat, that is another matter," he said. "The minister of immigration is becoming the minister of censorship," Chow told Canadian Press. "We don't have to agree with everything Mr. Galloway talks about. "But, at bare minimum, they should be allowed to express their points of view so Canadians can make decisions themselves. This is pure censorship and it's wrong." Jewish organizations B'nai Brith and the Canadian Jewish Congress applauded the decision. "We applaud the government for its explicit recognition that individuals who glorify terrorism and promote hatred be denied access into Canada," said a statement from B'nai Brith's executive vice-president, Frank Dimant. Bernie Farber, CEO of the Canadian Jewish Congress, wrote: "George Galloway enables terrorism. In so doing he puts Canadian civilians at risk and comforts those who fight our soldiers in Afghanistan. The government's decision was the right one from legal, security and moral viewpoints." Galloway was expelled from the Labour party in 2003 after publicly lashing out against British involvement in the Iraq war. Labour party officials said Galloway's comments "incited foreign forces to rise up against British troops."